Experience Barbados at its finest and indulge in stylish luxury sailing on board Seaduced II – an ultra luxury 62ft catamaran with a modern and minimalistic interior design. Seaduced II boasts the very latest concepts in technology and has exceptionally desirable high end living comforts. 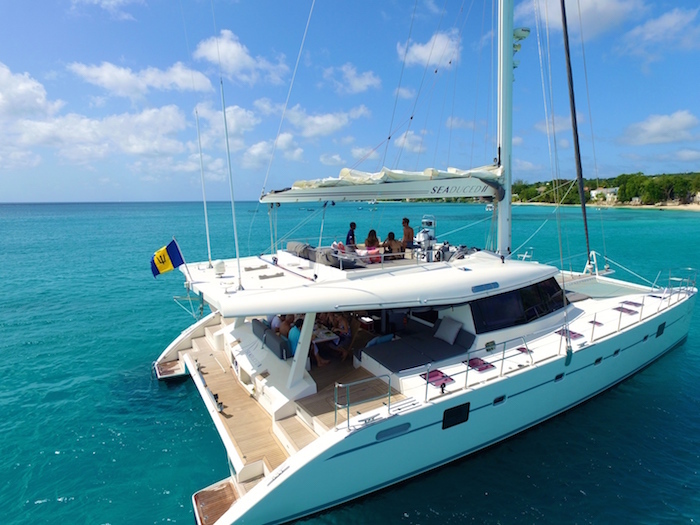 This luxury catamaran offers a spacious salon, a beautiful spacious teak cockpit, table seating for 16 guests, sunbathing and shaded areas on the fly bridge, and a further seating for 8. There are comfortable areas to relax and lounge in the cool interior whilst watching the chef perform his art or enjoying the AV system. Down below, guests have access to four double cabins with en suite bathrooms. With the perfect blend of style & soul, each cabin is individually tailored with the best decor and everything you’ll need to enjoy your time aboard. The spacious transoms allow easy access into and out of the water. Seaduced II offers guests a wide range of water sports. Request a kayak or a stand-up paddle board, and a full array of snorkel equipment are always on board to make every anchorage an adventure. The dinghy offers the young ones a variety of water toys adding even more excitement to your day, although these motorized options are only available subject to insurance approval. An up to date music collection adds to the ambiance, and can be heard from any area of the yacht. The crew can customise your itinerary, cuisine, beverage requests and activities, so you will experience the yacht charter lifestyle in just a few hours.